Excellent technique for crispy shallots, and I like that the oil is strained and kept for a shallot scented seasoning for other dishes in the book, so no waste. At first this looks like too many shallots for the oil/frying pan, but they shrink and it ends up perfect. The slow, one step technique is easy with delicious results. This version was a touch sweet as an accompaniment to the book's rice bowl, which has a very sweet dressing. Testing with the bahn mi next to see if it fares better. Easy and reasonably tasty. The grown ups liked but didn't love it. Probably won't repeat, but glad I tried it. I used crispy pre-fried (double fried style) cubes of tofu in this which absorbed all the sauce and led to a dry dish. Good flavors though, need to try again with a different tofu as I wasn't crazy about the texture as a dry dish. Very nice, and a hit with the whole family though I did need to make some adjustments. Couldn't get the rice crackers so I omitted them. Omitted cilantro because of personal preference. Used a marinated tofu which I then sliced and fried, wasn't wild about the texture so try a different tofu next time. Maybe pre-fried or just omit. The pomelo was yellow and not super flavorsome . Maybe the variety (honey) or the season. Looking forward to trying this with a really good pomelo and a really green mango, but even with less than perfect ingredients this was exciting to eat. I served this topped with the Tofu with tangy lemongrass ginger tamarind sauce, (instead of the suggested stir fried tofu with lemongrass and chili) - this ended up being far too sweet to go with the sweet sauce. Next time try the suggested topping. Despite this, the recipe was a winner, overall. I will use a different, less sweet topping next time, and switch to a thinner vermicelli - I had a slightly thicker than standard version (and make sure they are very dry). See also notes on the "everyday table sauce." Nice flavor, reminiscent of pad Thai with the tamarind and the peanuts. The noodles only needed 10 mins soaking with my brand of 3mm noodles. The final product turned out a tiny bit gloppy. I think the corn starch in the sauce might be to blame. Why add starch when it is a never ending battle against starchy rice noodles anyway? Also, he never mentions when to add the tofu. I added it at the same time as the noodles. This worked. Would repeat omitting the starch next time, and maybe reducing the water in the sauce a little. Very nice, but I felt it wasn't ideal served over rice noodles. (One of the suggested ways to serve it and the one we chose.) It was a bit too thick for this. Next time, serve over rice. The kiddo kind of liked it, even though it was a bit spicy for her. Delicious, refreshing, and a gorgeous color. Nice rich hibiscus flavor (had whole dried hibiscus flowers and allowed them to steep for 9 hours). Makes a lot of syrup, so try a half recipe next time. Syrup can also be used for cocktails and desserts, so should be able to use it up. This book is bursting with fresh, herb-focused, flavorful food. You won’t miss the meat a bit. Bringing exciting global flavors to your vegetarian table and try a recipe for Green Papaya Salad. Vegetarian cuisine never looked so good. Packed with flavor these recipes deliver Vietnamese cuisine in a light and refreshing, yet still satisfying manner. Meatless Vietnamese cooking for vegetarians and omnivores alike. In the years he spent living and cooking in Vietnam, Cameron Stauch learned about a tradition of vegetarian Vietnamese cuisine that is light and full of flavor. Based on recipes devised over centuries by Mahayana Buddhist monks, the dishes in Vegetarian Viet Nam make use of the full arsenal of Vietnamese herbs and sauces to make tofu, mushrooms, and vegetables burst with flavor like never before. 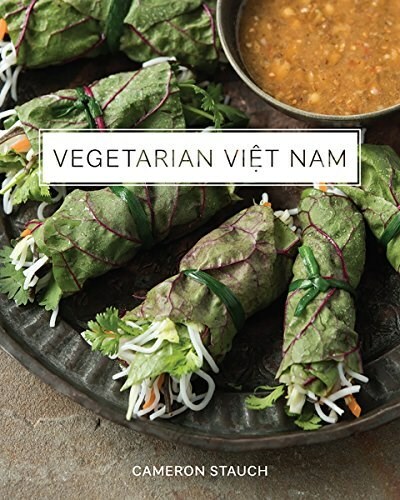 With a lavishly illustrated glossary that helps you recognize the mushrooms, noodles, fruits, and vegetables that make up the vegetarian Vietnamese pantry, Vegetarian Viet Nam will unlock an entire universe of flavor to people who want healthy, tasty, and sustainable food.